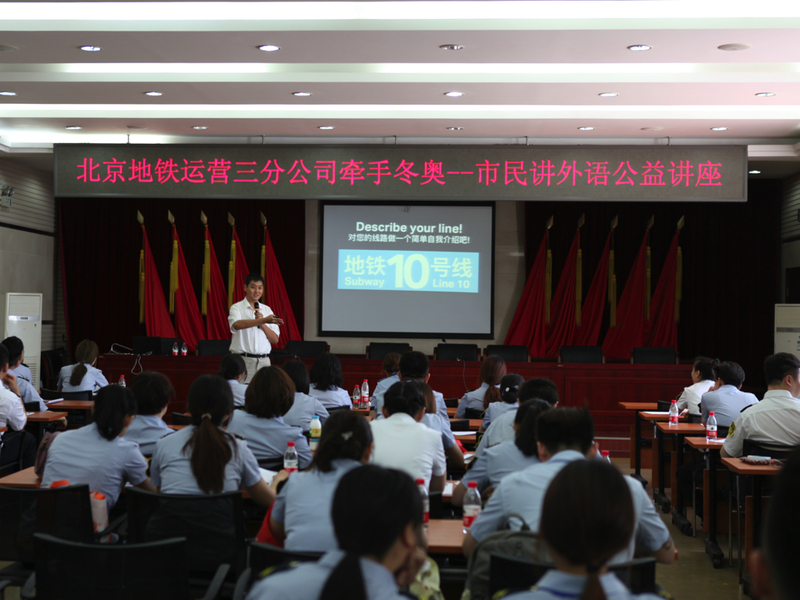 So City Hall got me the chance to speak to 90 of the Beijing Subway’s “Ops-3” (Third Operations) company. These guys manage Lines 2, 8, 10, and 13, which included the city’s two loop lines, and the arc line as well. We also went over the basic, included ten phrases used in ten situations — gateline English, at the platforms, to deal with interchange routes, and many others. Each phrase had no more than ten words in English, thus aptly being named 10•10•10. But we saved the best for last. I treated Subway crew to nearly a hundred phrases or so used at major interchanges and stations across town, in mock situations, and to deal with horrendously complex transfer situations. Drunk commuters in Wudaokou (after a hard night out), passengers lost in the horrific Xizhimen maze, travellers trying to flee the Jing at the huge Dongzhimen interchange, or those trying to chill out on Nanluoguxiang, were all part of what was taught.